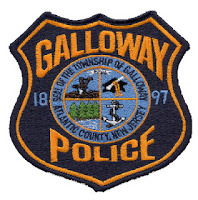 On August 17, 2013 at approximately 5:39 PM Galloway Township Police responded to a residence on Cherokee Dr for a report of a burglary. Samson Jenkins, 19, of Galloway was located as a suspect. During the investigation Officer Jacqueline Crocker located a male suspect in a nearby wooded area who was bleeding from several cuts. Upon further investigation it was learned that the suspect, Samson Jenkins, had cut himself while breaking a second story window in order to enter the victim’s residence. Stolen property from the residence was located on Jenkins as well as additional property from a burglary that was reported the day prior on Club Place. Additional stolen property including jewelry and electronics was located in the immediate area. Jenkins was charged with two counts of burglary and theft. A warrant was issued and he was transported to the Atlantic County Justice Facility on $40,000 bail. Officer Jacqueline Crocker and Detective Brian Casey are the arresting officers. Hi I was wondering if you have any information about the robbery on Club Place? I haven't heard anything from my neighbors and also haven't seen any police activity. It is usually pretty quiet here for the most part and this is kind of worrisome. We do not have additional information, but I will check with the PD and post their response here.